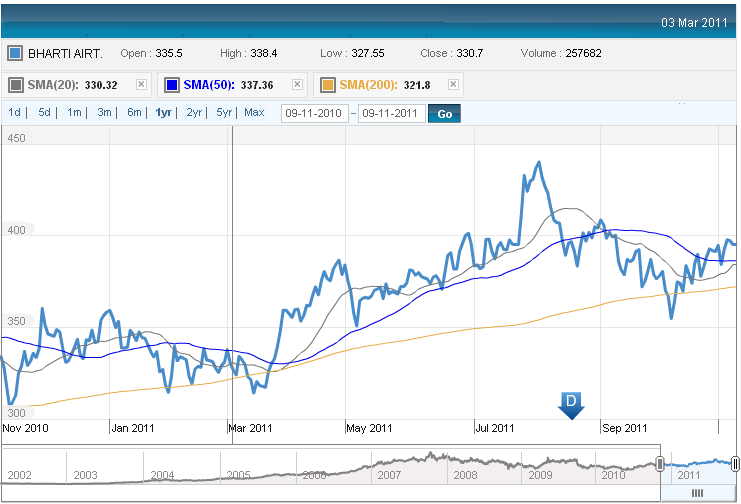 There is an update on this report called Bharti Airtel – This is a year of consolidation (Aug 2012) available for readers. Bharti Airtel is a large telecom player. The market leading India business is seeing high competition, but going forward the profitability will stabilize and improve. The next growth engines are Indian 3G and the 16 country African acquisition. Invest for the long term in this Indian – going – MNC Blue Chip. 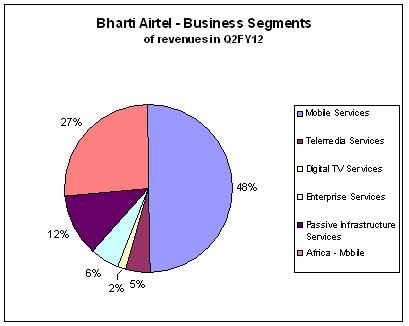 Bharti Airtel is the market leader in the Indian telecom sector. Incorporated as recently as 1995, it is a global telecom operator ranked #5 today in terms of customers. Other than India, Operations are spread over 18+ countries including Bangladesh, Sri Lanka and the African continent. Airtel has an aggregate of 237 million customers as of September 2011. Strategic Partner – Singapore Telecom is a key Partner and investor in Bharti Airtel. It will hasten the end of the intense competition phase and, through alliances and M&A, lower the number of players to 6-8. This can permit profitable telecom operations for most players. 3G is the next big thing for Indian telecom players. Driven by a growth in smartphone sales, enabled by the telecom operators, a whole new ecosystem of content, services and functionality is being set up. This includes internet browsing, entertainment services, application stores, video calling, enterprise services, m-Heath, m-Education, m-Commerce, e-governance, etc. These will drive usage, 3G penetration, subscriptions and ARPU, and help monetize the 3G license assets. By working with the industry bodies such as COAI, Bharti Airtel is defending its position on these issues. Many of these new conditions impose additional costs on the Telecom operators, which are unplanned for. 5. Airtel acquired the African telecom assets of Zain in 2010, for USD $9 billion in cash. This purchase is of a high growth franchise. As per Airtel estimates, Africa will eventually overtake India and China as a telecom market – as population of Africa will peak at 1.8 – 2.0 billion. By leveraging the balance sheet and sound financial engineering, Airtel was able to service this loan for only $200m per year in 2010. 6. Mobile Number Portability was perceived as a threat for Airtel. However, the first year of experience of this consumer facility shows that it has not materially reduced market shares. 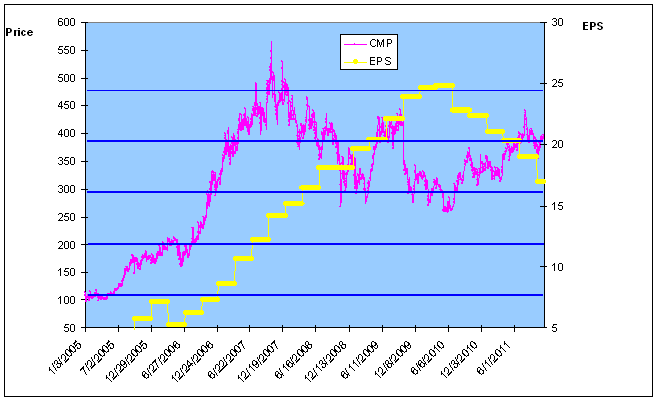 CMP is 395. 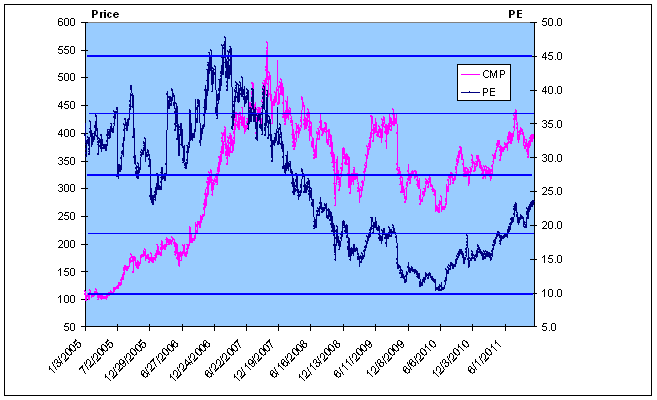 In the last 7 years, the market price has appreciated at 21% per annum CAGR. It is below the all time high of 565 in Oct 2007. See Fig 3. 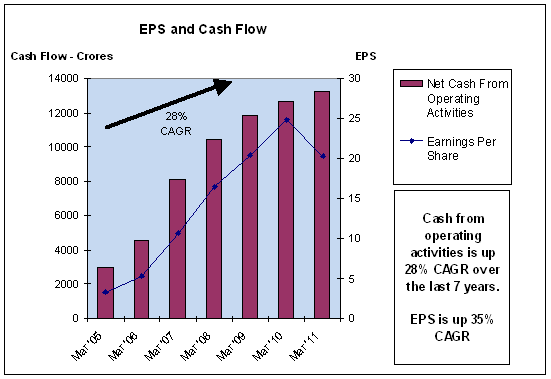 EPS growth in the last 7 years has been 35% CAGR. 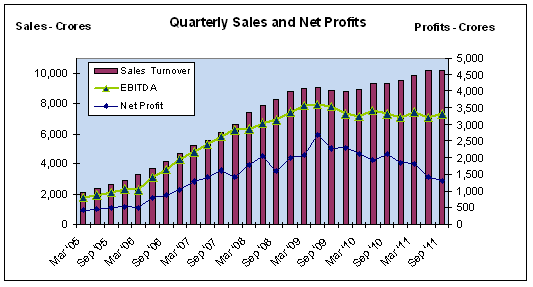 Even so, we can see the trends – EPS had a rapid expansion from 2005 to 2009, but has fallen off in the last 2 years. The Good News? Expectations now are that the period of falling consumer prices in telecom are over. The hyper competition phase has played out, and EPS will stabilize and start their climb once again for Airtel. Sales have grown steadily at 23.4% over the past 7 years. Net profits have also appreciated at 21.3%. We can see however, that profits which were rising rapidly till 2009, have tapered down recently. This is due to industry hyper competition. Telecom is a very resource intensive business. Airtel has managed this well, and has grown the Cash generated from operations at 28% CAGR over the last 7 years. EPS growth has been higher at 35%. Debt / Equity is 0.7 for the consolidated entity. This is a comfortable level for a telecom player. Poor regulatory conditions in India. The telecom sector continues to be buffeted by ad-hoc ism in policy matters, and overlapping jurisdictions of TRAI, DoT and the Ministry. The revenue short government may exert additional pressure to raise receipts, sacrificing industry growth. The current policy directive is to allow M&As and reduce competition intensity in the sector. If this is not implemented, or even reversed in some way, the hyper competition environment may continue to haunt this sector, affecting profitability and margins. The interest rate has risen in India. This increases debt servicing costs. Expectations are that rates have peaked in India, and should fall going forward. Revenue and capital leakage into unrelated diversifications of Bharti group like Retail, Insurance, foods, etc. However this risk is fading as Bharti Airtel corporate governance standards are high, and investments are being made independently by the holding company, Bharti Enterprises. Airtel essentially has two large businesses, India (mature asset) and Africa (growth). In India, the major investments have been made; the revenues are large and growing, and the high competition is expected to ease up. Over the next few quarters, all metrics will point up – Cash flow, operating margins and net profits, in addition to revenues which has held up well. In Africa, we will see Airtel slowly establish itself, move from #3, 4 or 5 in the market to #1 or 2. In country after country, it is engaging with the government, trade and consumers, to roll out its ‘minutes factory’, ‘network infrastructure sharing’ and ‘partner with the best vendors’ approach. The 2013 target for Airtel Africa is $5 billion of revenues. The recent bottom of the Airtel share was Rs 255 in June 2010. The share has been moving up thereafter and has appreciated 55% to today’s 396. The stock will continue its upward march, as it continues to deliver on stated corporate goals. At current levels, Airtel share is above 20, 50 and 200 DMA levels. See Fig 7. This indicates the share is likely to continue to move up. I recommended the Airtel stock in my report in December 2010. See Link. I reiterate my recommendation to Buy. My 18 month target for this stock is 800.